Corvette Racing will attempt to return to the poidum at Le Mans this weekend. 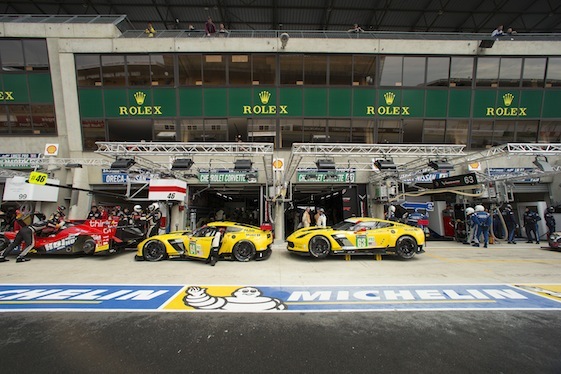 Still, a major point of interest for American road racing fans at this weekend’s 24 Hours of Le Mans should be the C7.Rs vs. the GTs in the GTE Pro class at the 85th running of the world’s most important sports car race. For the whole of the current century, Corvette Racing has been the top hope for American marques in the top GT categories at Le Mans. And eight times in 16 years, the team’s cars took top honors in those classes. During those years, Corvettes’ chief competition came from foreign automakers like Ferrari, BMW, Aston Martin and Porsche. It was kind of fun for the Corvetteers and their fans to beat those iconic automakers on their own side of the Atlantic. But it all lacked the Yank vs. Yank component. Ford GTs took Le Mans by storm last year. They’re going back for more this weekend. program for the 2016 season. With Indycar/NASCAR team owner Chip Ganassi at the helm, Ford GTs took the track first at the 2015 Rolex 24 at Daytona International Speedway. Then it was off to Sebring and finally that year, Le Mans. 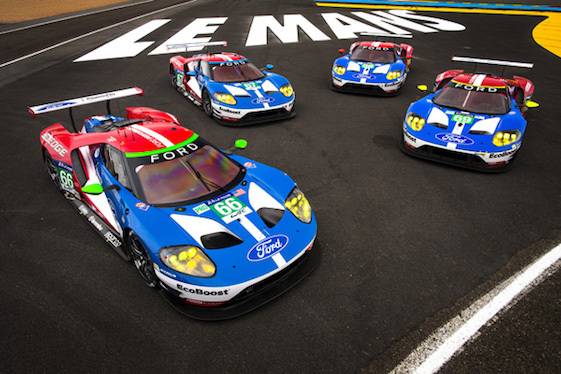 For the race at the Circuit de la Sarthe, Ganassi and Ford took no chances as they entered four cars in the 34. The effort and logistics paid off with two podium finishes including the occupation of the top step of that podium. “It was pretty incredible to win in an American car, for an American team owner like Chip Ganassi,” Joey Hand, who, along with co-drivers Sebastien Bourdais of France and Dirk Mueller of German, got the victory. The much-hyped storyline for Ford’s return to Le Mans centered on the 50th anniversary of Ford GT 40s taking on and beating the hated factory Ferrari team headed by the loathed Enzo Ferrari. Ford vs. Chevy became the most distant of subplots last year. It was Ford beating the Ferrari 488 of Risi Competizione, which finished second. This year, with the Ford vs. Ferrari thing dealt with, Chevy vs. Ford becomes elevated. Especially after last year’s Le Mans race – a race in which the Corvette C7.Rs finished seventh and 10th (DNF). Both Chevy and Ford has something to prove this weekend. The team will once again bring two C7.Rs to France. The No. 63 Corvette will be driven by Garcia, Jan Magnussen and Jordan Taylor. The No. 64 will be driven by Tommy Milner, Oliver Gavin and Marcel Fassler. Ford, once again, will blitz Le Mans with four GTs. Two of them – the Nos. 66 and 67 machines – regularly compete in the FIA World Endurance Championship and are based in the U.K. The other two, which usually wear Nos. 66 and 67 in the IMSA WeatherTech Championship, will be carrying Nos. 68 and 69 at Le Mans. The No. 69 lineup is the same as it was a year ago with Ryan Briscoe, Richard Westbrook and Scott Dixon sharing the ride. In the 68, Bourdais, who was injured in Indianapolis 500 qualifying, will be replaced by Tony Kanaan. Ford’s impetus? Do it again. Looking to make the GT Pro race a Yank vs. Yank vs. Yank affair will be the No. 82 Ferrari 488 of the Houston, Texas-based Rizi Comp team. This year the car will be driven by regulars Giancarlo Fisichella and Toni Vilander. They will be joined by Pierre Kaffer. Their car is brand new but has been tested. On Thursday, Garcia put the No. 63 Corvette C7.R on the second row in the class, and Tommy Milner’s best lap in the No. 64 assured that both cars will be in the thick of the fight in this weekend’s twice-around-the-clock endurance classic. Garcia’s best lap was a 3:51.484 (131.731 mph) lap in the opening moments of Thursday’s final session. The No. 63 Corvette, which also will see Magnussen and Taylor driving, finished qualifying just 0.647 seconds off the pole-winning car. Garcia and Magnussen arrived at Le Mans with the championship lead in the IMSA WeatherTech SportsCar Championship’s GT Le Mans class with two victories including the Mobil 1 Twelve Hours of Sebring. Milner’s best lap was a 3:52.017 (131.420 mph) in the car he shares with Oliver Gavin and Marcel Fässler. Their gap to the front was relatively small considering the enormity of the track – about 8.5 miles in length. The 24 Hours of Le Mans starts at 9 a.m. ET on Saturday, June 17. FOX Sports and Radio Le Mans will offer live coverage throughout the race.